Cuncliffe, B.W. (2002). The Extraordinary Voyages of Pytheas the Greek. Penguin Books, New York, 183 pp. Nansen, F. (1897). The First Crossing of Greenland. Reprinted 2001, University Press of the Pacific, Honolulu, HI, 452 pp. Quote from p. 83. The freezing point of seawater as a function of salinity is given in most of the references above (e.g., Untersteiner, 1986). I adopt the treatment of sea-ice thermodynamics from Maykut (1978), Bitz and Lipscomb (1999), and Bitz and Marshall (2011) (see chapter 2). Hemispheric sea-ice extent and area are from Fetterer et al. (2002, updated 2010) (see chapter 1). Arctic ice-thickness data in figure 5.2a is based on Icesat satellite altimeter analyses of Kwok et al. (2009), available at http://rkwok.jpl.nasa.gov/ icesat/download.html. Antarctic ice thickness fields in figure 5.2b are model-generated, adapted from Timmermann et al. (2009). Timmermann et al. (2004) discuss the spatial patterns of Antarctic ice thickness based on the available long-term data. Kwok, R., G.F. Cunningham, M. Wensnahan, I. Rigor, H.J. Zwally, and D. Yi (2009). Thinning and volume loss of the Arctic Ocean sea ice cover: 2003-2008. 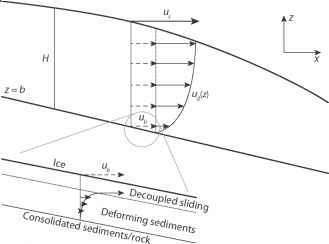 Journal of Geophysical Research, 114 (C070005), doi:10.1029/2009JC005312. Maykut, G.A. (1978). Energy exchange over young sea ice in the central arctic. Journal of Geophysical Research, 83 (C7), 3646-3658. Timmermann, R., A. Worby, H. Goosse, and T. Fichefet (2004). Utilizing the ASPeCt sea ice thickness dataset to evaluate a global coupled sea ice-ocean model. Journal of Geophysical Research, 109 (C07017), doi:10.1029/2003JC002242. Timmermann, R., S. Danilov, J. Schröter, C. Böning, D. Sido-renko, and K. Rollenhagen (2009). ocean circulation and sea ice distribution in a finite element global sea ice-ocean model. Ocean Modelling, 27 (3-4), 114-129.